Clogged drains can be a source of major frustration! Clogs are one of the most common home plumbing issues, and luckily fixing a clogged drain is probably something you can do yourself. Whether or not you are a home owner, everyone should know how to unclog a drain. Believe it or not, sometimes a clog can be cleared with simple, environmentally friendly, homemade remedies! How to Unclog a Drain with a Suction Cup/Plunger: If your clogged drain is in a toilet, sink, shower or bathtub, Take a suction cup plunger and pump it up and down directly over the clogged drain. Standing water around the plunger will provide a seal. If the suction cup does not clear the drain in a few minutes, move on to these other tips for unclogging a drain without chemicals. How to Unclog a Sluggish Drain: If the drain is sluggish but not completely clogged, turn on the hot water tap for 5 to 10 minutes. This sometimes opens the drain. For a Moderately Clogged Drain: Pour 1/2 cup of baking soda down the drain followed by 1/2 cup of vinegar. Be careful. These two ingredients do interact with foaming and fumes, so replace the drain cover loosely. Let the concoction sit for about three hours before running water. 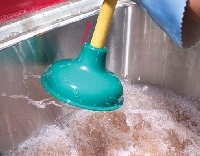 For a Grease Clog: Pour in 1/2 cup of salt and 1/2 cup of baking soda followed by a teakettle of boiling water. Allow to sit overnight. Plumbing and Drain Upkeep: You can keep your drains clog-free and odorless by using the following homemade non-corrosive drain cleaner weekly. Combine 1 cup baking soda, 1 cup table salt, and 1/4 cup cream of tartar. Stir ingredients together thoroughly and pour into a clean, covered jar. Pour 1/4 cup of mixture into drain, and immediately add 1 cup boiling water. Wait 10 seconds, then flush with cold water. Flushing weekly with a generous amount of boiling water also works well to prevent clogs. How to Unclog a Drain With a Drain Snake: A drain snake (also known as a drain auger) is a long, flexible, metal device that bends around corners as you push it into a plugged up drain. Basic snakes cost less than $50 at your local hardware store. When you push the snake down the pipe and hit an obstruction, turn the crank handle and the snake chews its way through.